In theory, the algorithm for detecting dark matter is straightforward: 1) wait until a dark matter particle hits a nucleus in your detector hard enough to produce a visible recoil, 2) count the events and collect the Nobel prize, or set a limit on the dark matter scattering cross section on nucleons. The reality is more complex. Typical models of dark matter models predict the largest signal near the energy threshold of the detector where it is susceptible to all kinds of spooky background and noise. For this reason, the field of dark matter detection, with multiple contradictory claims and a good deal of bad blood, reminds of medieval England at the time of the Wars of the Roses. The latest claim of a dark matter signal from the CDMS experiment brings a new hope but also adds to the confusion. For most of the previous decade CDMS was the most sensitive direct detection experiment. Their primary target was germanium, but they also had a number of silicon target detectors. The latter are more advantageous to study light dark matter - with mass of order 10 GeV - because silicon nuclei are lighter than the germanium ones, and thus are more prone to get a kick from a light dark matter particle. 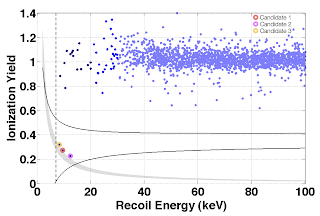 In the analysis of 56 kg*days of data collected in 2006-2007, posted on arXiv just yesterday, no event passes the cuts designed to separate dark-matter-like recoils from background. To everyone's surprise, CDMS just announced that in the 124 kg*day of data collected in 2007-2008 three events the cuts, while the expected background is 0.4 event. In the past, several underground experiments (DAMA, CoGeNT, CRESST) have detected an excess of events, but it's the first time an excess of this magnitude appears in a low-background apparatus. The probability for the background to produce 3 events is 5%, which would amount to a 2 sigma fluctuation. On the other hand, testing the background hypothesis against the one of light dark matter with the mass of 9 GeV and the cross section of 2*10^-41cm^2 prefers the latter at the 3 sigma level, apparently because the recoil energies and the ionization yields of the events perfectly fit the dark matter hypothesis. Statistics is not an exact science, so you can take either of these two numbers as an estimate of the significance of the CDMS signal, depending on your priors and your allegiance. The significance is probably smaller than 3 sigma anyway if the latest data are combined with the previous silicon and germanium data, which show no signal in the low mass range. However, the precise significance is not the most important issue here; in the end, we sometimes shrug off 9 sigma signals. To the right, what looks like Pollock's painting is in fact a summary of best-fit signal regions and limits from various underground experiments in the dark matter mass vs. cross section parameter space. The most worrying aspect of the CDMS result is that the signal region seems comfortably excluded by the limits from Xenon-10 and Xenon-100 experiments (the green lines in the plot). To reconcile these results one must either assume a serious systematic issue with the xenon analyses, or consider more exotic dark matter models, for example the xenophobic ones where the effective coupling to xenon nuclei is suppressed. 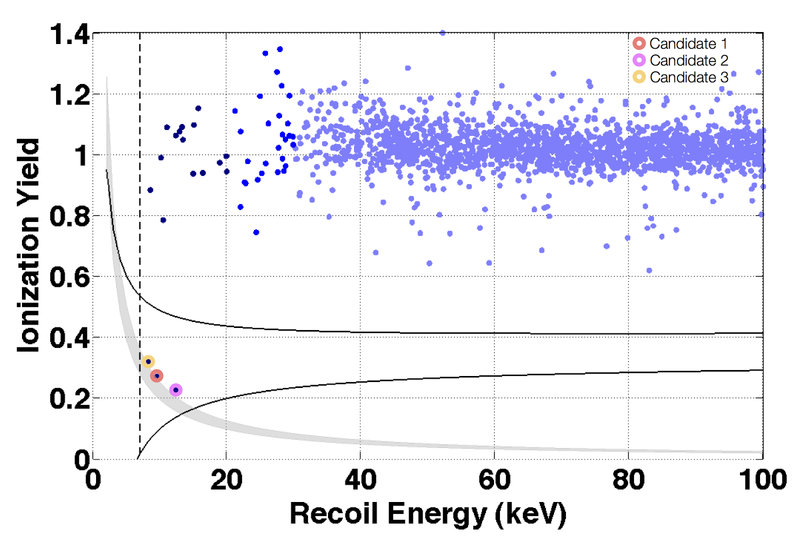 On the other hand, the region of the parameter space preferred by CDMS is consistent with the earlier detection claim by the germanium target detector CoGeNT. So, dark matter, a fluke, or a fundon? Unfortunately, the past experience with direct detection experiments suggests that we will not learn the definitive answer anytime soon. This result is entirely what you would expect based on my BSM model that God hates xenon and designed the universe such that dark matter would be invisible to it. As you can see, if you tweak the coupling of dark matter to up-quarks just so, it cancels the coupling to down-quarks such that dark matter is xenophobic. Spite-based models may also explain why the Higgs mass was just barely big enough to escape detection at the Tevatron. Seriously tho, didn't CDMS already put out a paper ruling out CoGeNT's annual-modulation signal? Were they hoping we had forgotten about that when they put their little star on top of the CoGeNT favored region? For the uninformed, why are we just hearing about 2007-2008 results now? What is it about this data that takes 5 years to analyze? X, what you say would make sense if the XENON10 or XENON100 detectors had a demonstrated sensitivity to this mass region. You are giving them too much credit. LUX, with a much lower threshold, will have something reliable to say soon. @Anonymous I'm no expert in which line on the plot is below which claimed signal of BSM physics, but my inexpert eye indicates to me that XENON have two lines excluding this cross-section in this mass region. If you have some favorite systematic error that you want to claim they're underestimating, it's polite to at least say what it is, so I can link you to XENON demolishing it in one of their countless follow-up papers demolishing supposed systematics and assorted excuse-making. One thing that is somewhat confusing is the interplay between energy resolution and threshold for these experiments. From what I understand, the energy threshold for liquid xenon experiments is too high for 8 GeV dark matter (with standard DM velocity dist), but because the energy resolution is poor for these experiments, you can still see those signals as fluctuations upwards into your threshold region. Can you explain more? Dark Matter research is starting to look a lot like epicycles and dancing angels. In the realm of galactic clusters and larger structures, DM does a great job of explaining observations (and hard data always trumps theory) but when you get down to individual galaxies and their satellites DM models are contradictory and fail to explain observations. Look at AMS-2; you have physicists saying that DM is only affected by gravity, so it "naturally" falls to the center... Yet you need DM out in the galactic halo to explain galactic rotation curves. Here on Earth, DM searches are basically trying to tease statistically significant data out of the background noise. I realize that it's hard, hard work, but it does have the same smell of desperation as superstring and SUSY. I don't know what the answer is; maybe a combination of known, boring particles (like neutrinos) and something like a modified theory of gravity for low acceleration regimes ( galaxies, their satellites and dwarf galaxies). The sad part is that proposing this as a graduate student in physics or astronomy, or as a non- tenured professor is tantamount to professional suicide. This isn't the way science should be done - follow the data, even if it takes you into a dark and uncomfortable place. Great build up to the punchline. On a serious note, I have some general questions. Wouldn't dark matter particles and their anti-particles have been generated at CERN? Wouldn't we have found evidence for dark matter particles in colliders like CERN if the energy of the DM particle was less than 100 GeV? Wouldn't we have noticed some missing matter that would have messed up our analysis of the CMS & ATLAS data without including such a dark matter particle. While the DM particles & anti-particles would have been hard to measured directly, we would have "known" they were there by the cross sections of collisions and calculations of missing matter, right? As you and others have stated, we've virtually ruled out the idea of dark matter candidates at these ranges of energy. To me, the idea of looking for "heavy" dark matter particles is an oxymoron. Think about the three main fermions (1st gen): u/d quarks, electrons, and e-neutrinos. The quark is heavier than the other fermions, and likewise it can interaction via the most forces (4). This is followed by the electron (3) and then the e-neutrino (2). Heavy particles (except up/down quarks) have a tendency to be unstable and react. If we are looking for a particle with virtually no interaction with other particles, the trend seems to point downward, not upwards. What gives a particle its mass has something to do with its ability to interact with other particles, so a "heavy" dark matter particle seems completely counter-intuitive. Which of course leads me (and others) to think that the most likely dark matter candidate is some combination of the various neutrinos. I think that we should focus on completely ruling neutrinos before we posit the existence of "heavy" dark matter particles because "heavy" dark matter particles, which seem to contradict the trend in the Standard Model that heavier fermions are more interactive&reactive. X, only a member of the XENON100 collaboration can regurgitate their Kool-aid like that ("demolishing"? this ain't no Transformers movie...). Good luck, truth is out there, somewhere. So, we have mostly mutually inconsistent detection signals, and exclusions that contradict the lot of them. Of course, there is the problem that the astronomy data have already determined that an 8 GeV to 20 GeVish mass dark matter particle is inconsistent with galactic structure. A dark matter model that comes close to fitting both the cosmic background data and the lack of satellite galaxy observations needs to be right around 2 keV to a pretty high degree of precision. And, any direct dark matter detection experiment based on collisions requires some force to give rise to those collisions. Yet, precision electroweak data pretty much rule out weakly interacting particles of less than 40 GeV, and the models rule out electromagnetically or strong force interacting particles. So, how does one manage to get collisions? You need a BSM force or non-point-like quarks. The theory is half baked. "I don't know what the answer is; maybe a combination of known, boring particles (like neutrinos) and something like a modified theory of gravity for low acceleration regimes ( galaxies, their satellites and dwarf galaxies)." Not a cosmologist [my interest is astrobiology, but the standard cosmology helps tremendously], but I assume the DM content that comes out of the CMB acoustic peaks makes any "modified theory of gravity for low acceleration regimes" negligible. On the other hand we have the Eris simulation, which albeit today not the latest word on what makes a spiral galaxy a spiral galaxy it was the first word - and the thing that made it work was DM. So DM predicts more data than ad hoc (aka "bla bla bla") gravity on all scales. I was surprised to see a reference to Xenon100 in 2011, knowing that they have better data in 2012, that contradict the present case the more. Then reading the paper on the arXiv, I noticed that the references to Xenon10 and Xenon100 were interchanged. I hope their physics is better, but I fear. @Anonymous: The case of neutrino dark matter is not at all ruled out. Since reactor experiments hint at mass-squared-differences of eV^2, there is likely a (perhaps sterile) neutrino of eV mass. Since the occupation is likely thermal, the Planck data conflict such a case. So we will learn more from the Katrin experiment. I wonder what the WMAP/Planck communities will say if indeed eV neutrinos exist. Apart from being unpopular, the neutrino-idea involves, yes, also some unresolved questions. While CDM models match large scale data (large galaxy clusters and greater) extremely well, it doesn't do well at all the smaller end of the scale (individual galaxies and their satellites and even globular clusters) where predictions fail to match observed properties, at least not without some unrealistic tweaking of models. MOND (or similar theories) match observed properties exceedingly well for most of these objects. "A Vast Thin Plane of Co-rotating Dwarf Galaxies Orbiting the Andromeda Galaxy"
Does the dark matter clump together or is it like a diffuse gas? If it clumps then it should be present in stars and planets and affect the density. If it falls into a black hole then would it emit radiation? The XENON10 bound shown in the above plot is too strong. The correct bound is significantly weaker, allowing for an interpretation of the CDMS-Si events in terms of standard spin-independent elastic scattering without being ruled out by any other experiment. for a discussion of CDMS and XENON. Jester, you have been silent for too long.Is the entire field of high energy physics really so dead right now? Awake, rise up, and do your duty to the blog-reading public!